As I've mention on Twitter I am planning to make my blog a little bit more lifestyle. I really like to go out and discover new places for food in London. This have been my second trip to The Diner and again this place have been amazing! 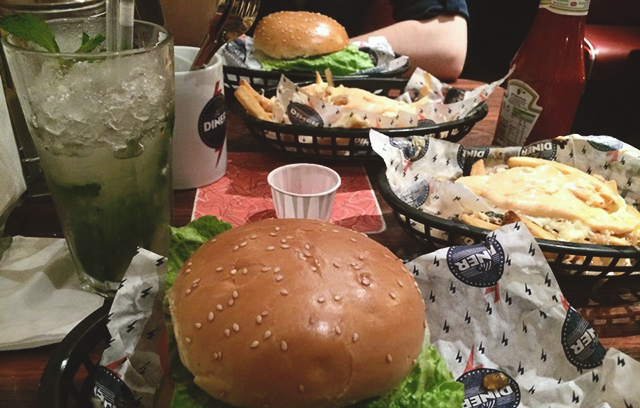 We went to the Camden Town Diner, we waited around 10minute for the table, which was completely fine, as we haven't booked a table in advance. I went out with my close friend, in total we tried out 6 drinks from the Menu, all were amazing! Diner Moijto and Red Slushy have been my winners. Red Slushy doesn't taste like alcohol at all, more like a berry smoothie. We did end up leaving the place slightly tipsy, okay maybe a little more. For the main I've ordered Cheese Burger, the best burger I've eaten so far in London (nothing beats the one I've had in High Wycombe). For the side I went for the Hanger fries, I never been a fan of onion, but the smokey onion got me like my oh my! My friend went for the exactly the same meal. Not sure how we manged to fit in the dessert, but we did decided to try it out. 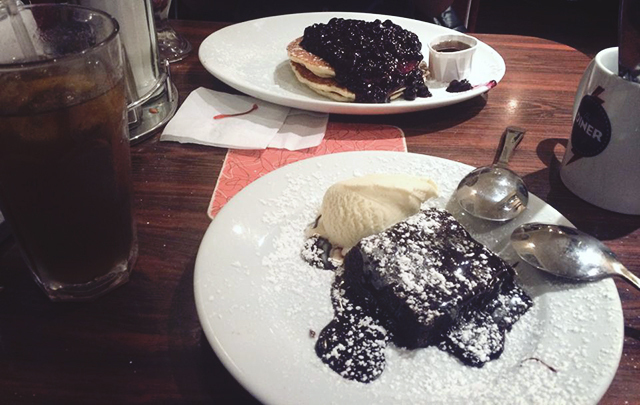 I went for the Chocolate Brownie, Ice Cream and Hot Fudge Sauce, that was just heaven in my mouth! I am craving is so much whilst I am writing this post. My friend went for the Blueberry Pancakes they tasted amazing too! I would definitely recommend The Diner if you near one, in total they have 7 restaurants, around London. Let's talk about the prices, for the main you pay around £7 which isn't too bad. I think the menu prices are pretty fair. You don't need to spend a fortune to leave with a full belly. Let me know if any of you been here before and what did you order? Now I really have to go check this place out. I'm drooling over here! favourite night combo, kiehl's it is!